my Guidance teacher Ms. Cripps had called me into her office with a great opportunity involving the John Howard Society. At this point I knew very little about the John Howard Society, but thanks to this summer’s experience, I have learned much more about what the John Howard Society is, and what they do. 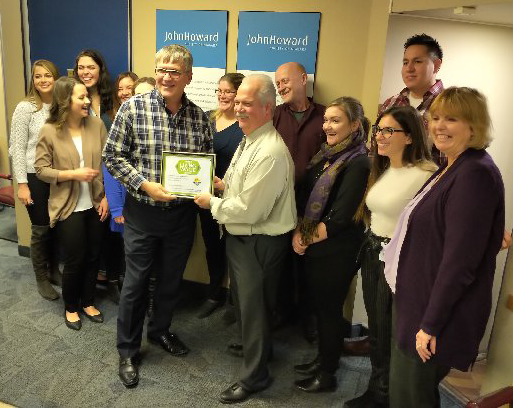 So on behalf of myself and all the other employees we thank the John Howard Society for all the experiences this opportunity has allowed us to gain. We had an excellent learning experience. We were taught important career skills, from writing resumes to working on our communication skills with our employers that we were able to apply at our placements. My placement was at the Welland Tennis Club where I was responsible for painting and keeping courts and the Club House in tip top shape which took me a while to master, but I am just about there now. More skills I have learned are how to organize tournaments for the Under 14 OTA’s and making and answering phone calls for the members of the club. While doing these tasks I learned life goals, initiative, being persistant with tasks which I was not good at and communicating with my employer as well as members. These work place skills we acquired will help us with future endeavors. My favourite part of this entire experience was coming to the Wednesday morning Workshops and meeting new people that would make the experience much interesting. Our youth leaders are just a few of these people. Every morning they would be there with smiles on their faces waiting to teach us something new and something that would help our everyday lives. At these workshops we learned very many employment achieving skills such as what to wear and what to say at interviews. They started things off by showing us the building blocks of how to build or resumes and how to present ourselves at interviews. There we learned a new skill every week. Skills like communication, teamwork, problem solving. I am sure all of the student employees can agree with me when I say the teamwork workshop was by far the best one. At this workshop we learned a lot about eachother in our groups. Our artistic akills, how well each of us would survive on the moon, our engineering skills for the egg drop and for the marshmallow tower. Workshops have helped us for our futures ahead. Thank you to all the employers who took the students under their wing, to show them real world work days. We must give the John Howard Society a huge thank you for providing this program. Finally congratulations to all the students for a great summer working. I want to before I get started, I am sorry if I repeat Danny. I don’t think that is necessarily a bad thing though; I think it shows how much the program helps us, no matter where we are living or who we are. My past stresses me out. Like others in the room, I have had a hard life. But I don’t regret my past because it has made me who I am today. I think that everyone who does have a tough life should think the same way. We can’t let the past drag us down, we can’t dwell on the past. The only thing we can do is take the next step. The future can be positive, but we have to take the first step. Last year I spent the summer locked in my room. I would probably be doing the same thing this summer if it wasn’t for this program. I consider these people friends. Even Ally, Steve and Marnie noticed that I have become a positive, outgoing person in workshop. My resource teacher at Grimsby Secondary recommended I join the program. I figured it would be a good opportunity to earn credits and get some cash. I definitely appreciate at this point, how much experience I have gained especially through work. I feel confident that I have learned important skills that I will need in future jobs. My Youth Worker Leaders were the bomb. I consider them like my older friends. They helped me at work, in workshops, and in life. This program is an amazing opportunity; most of you know this, and for other I am sure you will recognize that at some point in the future. The program gave me new skills, helped me strengthen skills I already had, and gives you an opportunity to learn valuable lessons through workshop and work. I learned things that I wouldn’t have learned by myself or through school. The lessons that we learn help us in the future, whether it be in school, work or in general, life.